Lysine — your body refuses to make it, but demands it anyway. L-lysine is an ‘essential amino acid’ — our bodies need it but cannot make it, and so it must be obtained from food or supplements. An average male adult requires about 37 mg of L-lysine per day per kilogram of body weight — about 2.7 grams/day for someone weighing 73 kg (160 lbs). This is the amount needed to avoid a serious lysine deficiency. Larger amounts are needed for optimum health. If you suffer chronically from any of these, it makes sense to try a lysine supplement — it’s a quick, easy, inexpensive, and risk-free thing to do. If that doesn’t work, then you can move on to a more dramatic treatment. 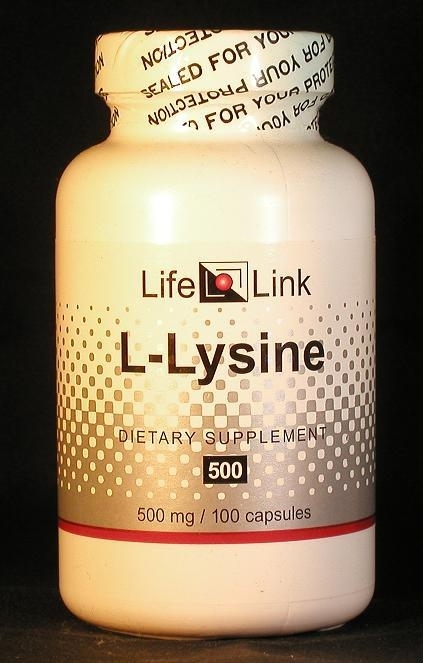 L-lysine is an ‘essential amino acid’ — that is, it is needed by the human body but not made there, and must be obtained from food or supplements. A male adult typically requires about 37 mg of L-lysine per day per kilogram of bodyweight1 — about 2.7 grams/day for someone weighing 73 kg (160 lbs). This is the amount needed to avoid lysine-deficiency ailments in a healthy person. More ambitious goals — beyond the mere avoidance of overt deficiencies — may require larger amounts than 37 mg/kg/day. Accordingly, we will limit our discussion of L-lysine to a brief summary of recent lysine research, and let you draw your own conclusions about what medical conditions it may be effective in treating. Let’s now examine the evidence for each of these effects. Other studies have shown that the herpes virus responds differently to different concentrations of the amino acids lysine and arginine. When the ratio of L-lysine to L-arginine is high, viral replication and the cytopathogenicity of herpes simplex virus have been found to be inhibited.2 This implies that to inhibit the herpes virus, arginine levels should be kept low. Dual amino-acid supplementation with L-lysine and L-arginine increases growth hormone levels without the need for large doses of either supplement. Studies using 1200-1500 mg of each supplement showed that significant increases in GH levels take place in the blood from 30 to 90 minutes after consumption.11,12 It appears that the best time to take arginine+lysine is when one is resting — not when one is about to exercise. Exercise itself causes growth hormone levels to rise, and the supplements do not push GH levels much higher than this.12 The implication of this evidence is that, with respect to GH levels, the supplement combination simulates the effects of exercise during non-exercise periods. A clinical trial in which elderly women were given a daily supplement consisting of 1.5 g lysine + 5 g arginine + 2 g beta-hydroxy-beta-methylbutyrate (HMB) showed “a 17% improvement in the ‘get-up-and-go’ functionality test … increased limb circumference, leg strength, handgrip strength, and positive trends in fat-free mass.”6 The HMB part of the combination is thought to slow the breakdown of muscle protein7 — the lysine-arginine part is the muscle-growth component which is not dependent on HMB for its effects. Despite these promising results of more than ten years ago, no further clinical trials have been conducted — neither by drug companies, nor through government funding — to develop Lysine/Arginine treatments for bone fractures or osteoporosis. The reasons are not hard to guess: Big Pharma is interested in developing blockbuster new drugs, not unpatentable supplements; and government medical research establishments are run by doctor-bureaucrats who oppose therapies that are available to patients without their having to visit doctors and ‘cross their palms with silver’ to get a prescription. But in the USA, thanks to the nutritional supplement act passed by Congress in 1994, people with bone fractures or osteoporosis can buy both L-lysine and L-arginine any time they want to. These are safe amino acid supplements that are far less expensive than prescription drugs, and require no time-consuming, wranglesome visits to over-priced physicians. Preliminary studies indicate that lysine consumption correlates with insulin responses — higher lysine consumption during a meal appears to stimulate insulin release.15 This work suggests that lysine supplementation at mealtime may improve the utilization of dietary sugars and fats, and discourage tissue-damaging episodes of hyperglycemia. Are L-lysine supplements useful for the conditions and purposes mentioned above? We aren’t allowed to tell you, so you should take a look at some of the references cited here, and then decide for yourself.